More isn’t always better but when it comes to QR Codes, that time-honored adage simply doesn’t hold water. QR Codes, which are one of the most popular call-to-actions available in the market today, are a great example of when more is better, simply because it creates more exposure for your brand. The more opportunities you offer your customers to see, recognize and engage with your code, the more scans you’ll get and the stronger a bond you’ll create with your consumers. Visual QR Codes are considered a worthwhile investment by most small businesses, as the added appeal that the image gives to your code generates interest and scans and is remembered later on. Yet while independent businesses often delight in creating delicately crafted Visual QR Codes, each a unique snowflake, larger businesses are usually interested in mass generation of QR Codes. They recognize the great advantages that QR Codes can bring them, not only through greater exposure but also through the various actions that they perform, such as providing personal details via a vCard. Offering their employees a chance to use a Visual QR Code on their business card, ensures that all the company’s employees have a similar vCard which can include company information and be updated automatically whenever the details change. Companies can choose whether to have their employees each create their own personal Visual QR Code, such as a Face QR Code, or whether to create a uniform Logo QR Code which would look identical on all of the cards yet lead to different vCards when each card is scanned. 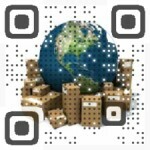 This is just one example of the uses for mass generation of QR Codes. Other popular uses are in the packaging and branding industries in which the Visual QR Code can be used to provide more information about the product and the area of authentication for which the Visual QR Code is especially relevant, as it is particularly difficult to copy. Interested in hearing about a mass generation solution for your company? Contact us and we’ll be happy to provide more information.